Lieutenant General. Siswondo Parman was born posthumously in Wonosobo, Central Java, August 4, 1918. He was one of seven heroes and victims of atrocities PKI revolution. Men born in Wonosobo, Central Java is an intelligence officer, so much to know about the secret activities of the PKI that's why he was one of the officers who refused PKI plans to form a Fifth Force consisting of workers and peasants. Hostility and rejection which makes murder victims PKI. Public education is a school that had attended primary level, secondary schools, and the College of Medicine. But before completing his doctor, the Japanese had occupied the Republic so that his doctor was not until he has made. Once can not go to medical school, he briefly worked at the Bureau Kenpeitai. There he suspected that the Japanese were arrested, but was soon freed again. After that, he even sent to Japan to participate in education at Kenpei Kasya Butai. On returning to the homeland he returned to work on the Bureau Kempeitai. Beginning his career in law began by following the People's Security Army (TKR) is RI Army which was formed after the proclamation of independence. At the end of bulanDesember, in 1945, he was appointed Chief of Staff of the Military Police Headquarters (PT) in Yogyakarta. During the Dutch Military Aggression II, he also fought with a guerrilla war. In December 1949 he was assigned as Chief of Staff of the Military Governor of Jakarta. One of its success when it was a secret movement to dismantle the Armed Forces Ratu Adil (APRA) which will conduct its operations in Jakarta, under the leadership Westerling. Subsequently, in March 1950, he was appointed Chief of Staff G. And a year later sent to the United States for his education at the Military Police School. Upon returning from the United States, he was assigned to the Ministry of Defence for a while and then was appointed Military Attache Affairs in London in 1959. The next five years ie in 1964, he was assigned as Assistant I Secretary / Chief of the Army (Men / Army Commander) with the rank of Major General. When I served Assistant Secretary / Chief of the Army (Men / Army Commander), the effect of PKI is also emerging in Indonesia. The Communist Party is feeling close to President Soekarno and some people were already affected. But as intelligence officer, S. Parman already knew a lot about the secret activities of the PKI. So when the Communist Party proposed that the workers and peasants were armed or called by the Fifth Army. He along with most other Army officers reject proposals that contain a hidden intent. With this basis then his enemy by the PKI. So the insurgency being waged by the Communist Party on 30 September 1965, he became one of the targets to be kidnapped and killed. And at dawn on October 1, 1965, Lieutenant General. Posthumous TNI S. Parman along with six other officers that Gen.. Achmad Yani TNI posthumously; Lieutenant. TNI posthumously Suprapto; Lieutenant. Posthumous TNI M.T. 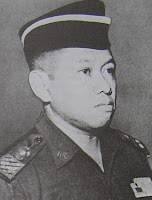 Haryono; Major General. Posthumous TNI D.I. Panjaitan; Major General. TNI posthumously Sutoyo S; and Captain Pierre Tendean posthumously CZI TNI successfully kidnapped then murdered and his body was blindly inserted into the old well in the area without prikemanusiaan Crocodile Hole. S. Parman died as heroes of the revolution to defend the Pancasila. Along with six other officers he was buried in the Garden of Eating Kalibata Heroes. The previous rank of Major General was then increased to a level of Lieutenant-General in recognition of his services. To honor these heroes, the New Order government has been decided on October 1 of each year as a day of miracle Pancasila as well as a national holiday. , And Crocodile Hole area, East Jakarta, in front of the old well where the bodies are found, the monument was built with the background is a statue of the seven heroes of the revolution. The monument is called Pancasila Monument supernatural powers.